Good news for Diabetics and Pasta Lovers!!! Now you can have your pasta and eat it too, without it raising your glucose and insulin as much as it previously did. Researchers on a BBC show called, "Trust Me, I'm A Doctor", decided to run a scientific experiment regarding resistant starch. 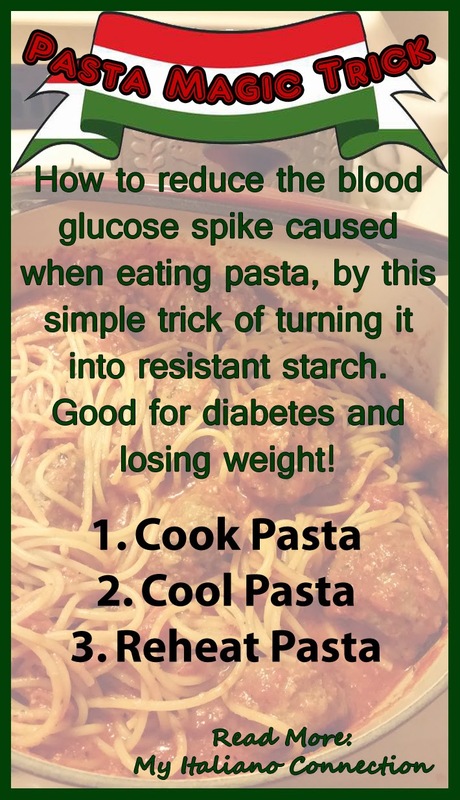 They tested the blood sugar on individuals over a three week period eating pasta freshly cooked, cold pasta, and pasta that had been cooked, cooled, and then reheated again. The results surprised them. "The reheated pasta was delicious, and bowls were emptied in seconds. But because of the experimental protocol, seconds were forbidden. This wasn't popular - one waiter claimed he would normally eat five times that amount for lunch. We were fairly confident the cold pasta would be more resistant than the stuff that had been reheated. Just as expected, the cold pasta gave less of a spike in blood glucose and insulin than freshly boiled pasta would. But then we found something very unexpected; the pasta that had been boiled, cooled and then reheated had an even more dramatic effect. Reheating the pasta seemed to make it even more resistant. This means less insulin, less blood glucose, less hunger and more fibre."